"Taxi" and "Taxi cab" redirect here. For other uses, see Taxi (disambiguation). "Taxicab driver" redirects here. It is not to be confused with the movie named "Taxi Driver". "Cab driver" redirects here. For The Mills Brother song, see "Cab Driver (song)". Although types of vehicles and methods of regulation, hiring, dispatching, and negotiating payment differ significantly from country to country, many common characteristics exist. Disputes over whether smartphone-based ride hailing services should be regulated as taxicabs has resulted in some jurisdictions creating a new classification called transportation network company. Harry Nathaniel Allen of The New York Taxicab Company, who imported the first 600 gas-powered New York City taxicabs from France in 1907, borrowed the word "taxicab" from London, where the word was in use by early 1907. "Taxicab" is a compound word formed from contractions of "taximeter" and "cabriolet". "Taximeter" is an adaptation of the German word taxameter, which was itself a variant of the earlier German word "Taxanom". "Taxe" (pronounced tax-eh) is a German word meaning "tax", "charge", or "scale of charges". The Medieval Latin word "taxa" also means tax or charge. "Taxi" may ultimately be attributed to τάξις from τάσσω meaning "to place in a certain order" in Ancient Greek, as in commanding an orderly battle line, or in ordaining the payment of taxes, to the extent that ταξίδι (taxidi) now meaning "journey" in Greek initially denoted an orderly military march or campaign. Meter is from the Greek μέτρον (metron) meaning "measure". A "cabriolet" is a type of horse-drawn carriage, from the French word "cabrioler" ("leap, caper"), from Italian "capriolare" ("to jump"), from Latin "capreolus" ("roebuck", "wild goat"). An alternative, folk-etymology holds that it was named for Franz von Taxis, a 16th-century postmaster for Philip of Burgundy, and his nephew Johann Baptiste von Taxis, General Postmaster for the Holy Roman Empire. Both instituted fast and reliable postal services (conveying letters not people) across Europe. The taxicabs of Paris were equipped with the first meters beginning on 9 March 1898. They were originally called taxamètres, then renamed taximètres on 17 October 1904. Horse-drawn for-hire hackney carriage services began operating in both Paris and London in the early 17th century. The first documented public hackney coach service for hire was in London in 1605. In 1625 carriages were made available for hire from innkeepers in London and the first taxi rank appeared on the Strand outside the Maypole Inn in 1636. In 1635 the Hackney Carriage Act was passed by Parliament to legalise horse-drawn carriages for hire. Coaches were hired out by innkeepers to merchants and visitors. A further "Ordinance for the Regulation of Hackney-Coachmen in London and the places adjacent" was approved by Parliament in 1654 and the first hackney-carriage licences were issued in 1662. A similar service was started by Nicolas Sauvage in Paris in 1637. His vehicles were known as fiacres, as the main vehicle depot apparently was opposite a shrine to Saint Fiacre. (The term fiacre is still used in French to describe a horse-drawn vehicle for hire, while the German term Fiaker is used, especially in Austria, to refer to the same thing). The hansom cab was designed and patented in 1834 by Joseph Hansom, an architect from York as a substantial improvement on the old hackney carriages. These two-wheel vehicles were fast, light enough to be pulled by a single horse (making the journey cheaper than travelling in a larger four-wheel coach) were agile enough to steer around horse-drawn vehicles in the notorious traffic jams of nineteenth-century London and had a low centre of gravity for safe cornering. Hansom's original design was modified by John Chapman and several others to improve its practicability, but retained Hansom's name. These soon replaced the hackney carriage as a vehicle for hire. They quickly spread to other cities in the United Kingdom, as well as continental European cities, particularly Paris, Berlin, and St Petersburg. The cab was introduced to other British Empire cities and to the United States during the late 19th century, being most commonly used in New York City. The first cab service in Toronto, "The City", was established in 1837 by Thornton Blackburn, an ex-slave whose escape when captured in Detroit was the impetus for the Blackburn Riot. Electric battery-powered taxis became available at the end of the 19th century. In London, Walter C. Bersey designed a fleet of such cabs and introduced them to the streets of London on 19 August 1897. They were soon nicknamed 'Hummingbirds’ due to the idiosyncratic humming noise they made. 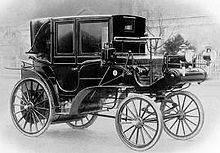 In the same year in New York City, the Samuel's Electric Carriage and Wagon Company began running 12 electric hansom cabs. The company ran until 1898 with up to 62 cabs operating until it was reformed by its financiers to form the Electric Vehicle Company. The modern taximeter was invented and perfected by a trio of German inventors; Wilhelm Friedrich Nedler, Ferdinand Dencker and Friedrich Wilhelm Gustav Bruhn. The Daimler Victoria—the world's first gasoline-powered taximeter-cab—was built by Gottlieb Daimler in 1897 and began operating in Stuttgart in 1897. Gasoline-powered taxicabs began operating in Paris in 1899, in London in 1903, and in New York in 1907. The New York taxicabs were initially imported from France by Harry N. Allen owner of the Allen-Kingston Motor Car Company. Their manufacturing took place at Bristol Engineering in Bristol, Connecticut where the first domestically produced Taxicabs were built in 1908, designed by Fred E. Moskovics who had worked at Daimler in the late 1890s. Albert F. Rockwell was the owner of Bristol and his wife suggested he paint his taxicabs yellow to maximise his vehicles' visibility. Fred was one of the organizers of the first Yellow Taxicab Company in New York. Taxicabs proliferated around the world in the early 20th century. The first major innovation after the invention of the taximeter occurred in the late 1940s, when two-way radios first appeared in taxicabs. Radios enabled taxicabs and dispatch offices to communicate and serve customers more efficiently than previous methods, such as using callboxes. The next major innovation occurred in the 1980s when computer assisted dispatching was first introduced. Paris taxis played a memorable part in the French victory at First Battle of the Marne in the First World War. On 7 September 1914, the Military Governor of Paris, Joseph Gallieni, gathered about six hundred taxicabs at Les Invalides in central Paris to carry soldiers to the front at Nanteuil-le Haudoin, fifty kilometers away. Within twenty-four hours about six thousand soldiers and officers were moved to the front. Each taxi carried five soldiers, four in the back and one next to the driver. Only the back lights of the taxis were lit; the drivers were instructed to follow the lights of the taxi ahead. The Germans were surprised and were pushed back by the French and British armies. 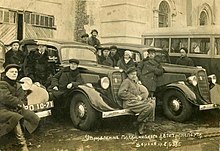 Most of the taxis were demobilized on 8 September but some remained longer to carry the wounded and refugees. The taxis, following city regulations, dutifully ran their meters. The French treasury reimbursed the total fare of 70,012 francs. The military impact of the soldiers moved by taxi was small in the huge scale of the Battle of the Marne, but the effect on French morale was enormous; it became the symbol of the solidarity between the French army and citizens. It was also the first recorded large-scale use of motorized infantry in battle. The Birmingham pub bombings on 21 November 1974, which killed 21 people and injured 182, presented emergency services with unprecedented peacetime demands. According to eyewitness accounts, the fire officer in charge, knowing the 40 ambulances he requested were unlikely to be available, requested the Taxi Owners Association to transport the injured to the nearby Birmingham Accident Hospital and Birmingham General Hospital. Taxi services are typically provided by automobiles, but in some countries various human-powered vehicles, (such as the rickshaw or pedicab) and animal-powered vehicles (such as the Hansom cab) or even boats (such as water taxies or gondolas) are also used or have been used historically. In Western Europe, Bissau, and to an extent, Australia, it is not uncommon for expensive cars such as Mercedes-Benz to be the taxicab of choice. Often this decision is based upon the perceived reliability of, and warranty offered with these vehicles. These taxi-service vehicles are almost always equipped with four-cylinder turbodiesel engines and relatively low levels of equipment, and are not considered luxury cars. This has changed though in countries such as Denmark, where tax regulation makes it profitable to sell the vehicles after a few years of service, which requires the cars to be well equipped and kept in good condition. In recent years, some companies have been adding specially modified vehicles capable of transporting wheelchair-using passengers to their fleets. Such taxicabs are variously called accessible taxis, wheelchair- or wheelchair-accessible taxicabs, modified taxicabs, or "maxicabs".. Wheelchair taxicabs are most often specially modified vans or minivans. Wheelchair-using passengers are loaded, with the help of the driver, via a lift or, more commonly, a ramp, at the rear of the vehicle. This feature is however a subject for concern amongst Licensing Authorities who feel that the wheelchair passenger could not easily exit the vehicle in the event of accident damage to the rear door. The latest generation of accessible taxis features side loading with emergency egress possible from either of the 2 side doors as well as the rear. The wheelchair is secured using various systems, commonly including some type of belt and clip combination, or wheel locks. Some wheelchair taxicabs are capable of transporting only one wheelchair-using passenger at a time, and can usually accommodate 4 to 6 additional able-bodied passengers. Wheelchair taxicabs are part of the regular fleet in most cases, and so are not reserved exclusively for the use of wheelchair users. They are often used by able-bodied people who need to transport luggage, small items of furniture, animals, and other items. Because of this, and since only a small percentage of the average fleet is modified, wheelchair users must often wait for significantly longer periods when calling for a cab, and flagging a modified taxicab on the street is much more difficult. Taxicabs in less developed places can be a completely different experience, such as the antique French cars typically found in Cairo. However, starting March 2006, newer modern taxicabs entered the service operated by various private companies. Taxicabs differ in other ways as well: London's black cabs have a large compartment beside the driver for storing bags, while many fleets of regular taxis also include wheelchair accessible taxicabs among their numbers (see above). Although taxicabs have traditionally been sedans, minivans, hatchbacks and even SUV taxicabs are becoming increasingly common. In many cities, limousines operate as well, usually in competition with taxicabs and at higher fares. Recently, with growing concern for the environment, there have been solar powered taxicabs. On 20 April 2008, a "solar taxi tour" was launched that aimed to tour 15 countries in 18 months in a solar taxi that can reach speeds of 90 km/h with zero emission. The aim of the tour was to spread knowledge about environmental protection. Most places allow a taxi to be "hailed" or "flagged" on the side of the street as it is approaching. Another option is a taxi stand (sometimes also called a "cab stand," "hack stand," "taxi rank," or "cab rank"). Taxi stands are usually located at airports, railway stations, major retail areas (malls), hotels and other places where a large number of passengers are likely to be found. In some places —Japan, for example— taxi stands are arranged according to the size of the taxis, so that large- and small-capacity cabs line up separately. The taxi at the front of the line is due (barring unusual circumstances) for the next fare. Passengers also commonly call a central dispatch office for taxis. In some jurisdictions, private hire vehicles can only be hired from the dispatch office, and must be assigned each fare by the office by radio or phone. Picking up passengers off the street in these areas can lead to suspension or revocation of the driver's taxi license, or even prosecution. A recent method for ordering a taxi is through a "Push Device". This method can be seen with devices such as the Taxi Butler and the Taxi Button. This new approach has created a shortcut to getting a Taxi for consumers, with the push of a button. The push generates an order in the dispatch system and sends out a car to the location of the button push. Other areas may have a mix of the two systems, where drivers may respond to radio calls and also pick up street fares. E-hailing is a system whereby passengers hire the taxi using mobile devices. While not directly involving the call center, the taxis are still monitored by the dispatcher through GPS tracking. It is used by services such as Gett, Easy Taxi, and GrabTaxi. In this scene from It's a Mad, Mad, Mad, Mad World, a yellow cab driver, played by Peter Falk, contacts his dispatch through a callbox on the street. Two-way radio communication had not become a standard by the time the film was made in the early 1960s. Taxis waiting for customers in Cologne, Germany. When a customer calls for a taxi, a trip is dispatched by either radio or computer, via an in-vehicle mobile data terminal, to the most suitable cab. The most suitable cab may either be the one closest to the pick-up address (often determined by GPS coordinates nowadays) or the one that was the first to book into the "zone" surrounding the pickup address. Cabs are sometimes dispatched from their taxi stands; a call to "Top of the 2" means that the first cab in line at stand #2 is supposed to pick someone up. In offices using radio dispatch, taxi locations are often tracked using magnetic pegs on a "board"—a metal sheet with an engraved map of taxi zones. In computerized dispatch, the status of taxis is tracked by the computer system. In the United States, there is a Taxicab Radio Service with pairs assigned for this purpose. A taxi company can also be licensed in the Business Radio Service. Business frequencies in the UHF range are also licensed in pairs to allow for repeaters, though taxi companies usually use the pair for duplex communications. In many countries however, the influence of mobile telecom operators through 8294 premium short code or alikes, which direct millions of mobile calls to the TAXI companies contracted (as 8.2.9.4 shortcode means T.A.X.I on any mobile phone worldwide), do influence the business trends when hailing for a TAXI, already impacted initially by the emergence of large radio dispatching private or virtual networks. Also independent taxi owners, as well as TAXI companies started in response to advertise long vanity phone numbers including 8294 number as vanity code for TAXI, for customer easy remembering of their commercial line when in need for a TAXI. Because of the overwhelming possession and use of mobile phone, the battle has moved to smartphone related marketing and mobile services CRM for taxi, through mobile universal directories of TAXI details, available worldwide on any mobile phone downtown or at the airport, as mobile directories such as www.8294.tel alternatively to yellow pages paper book edition, and also in competition with the launch of multiple mobile apps offering location services, taxis fare calculation, as well as direct call to TAXIs contracted by app editor. The ongoing trend of mobile usage is reshaping progressively the taxi business initially born as a nearly fixed infrastructure business regulated and ruled by City Halls. Taxi dispatch is evolving in connection to the telecom sector with the advent of smart-phones. In some countries such as Australia, Canada, Germany, the UK and USA, smartphone applications are emerging that connect taxi drivers directly with passengers for the purpose of dispatching taxi jobs, launching new battles for the marketing of such apps over the potential mass of Taxi users. Taxi Fares are set by the State and City where they are permitted to operate. The fare includes the 'drop', a set amount that is tallied for getting into the taxi plus the 'per mile' rate as has been set by the City. The taxi meters track time as well as miles in a typical taxi fare. In the United States, a nut is industry slang for the amount of money a driver has to pay upfront to lease a taxi for a specific period of time. Once that amount is collected in fare, the driver then begins to make a profit. A driver "on the nut" is trying to earn back the initial cost. This varies from city to city though, in Las Vegas, Nevada, all taxicabs are owned and operated by the companies and all drivers are employees (hence no initial cost and earn a percentage of each fare). So "on the nut" simply means to be next in a taxi stand to receive a passenger. New South Wales: There is an annual taxi licence determination which sets the maximum number of taxis allowed in specified areas. To be eligible you must have a taxi licence which is available from ABLIS. The industry body is the NSW Taxi Council and it provides a pathway to becoming a taxi driver. Northern Territory: Apply for a Commercial Passenger Vehicle licence (H endorsement) and ID card. Queensland: Apply for a driver authorisation. South Australia: Apply for South Australian driver accreditation with the SA government then complete training with a registered training provider. New Zealand taxi drivers fall under the definition of a Small Passenger Service Vehicle driver. They must have a P (passenger) endorsement on their driver licence. Until 1 October 2017, all drivers wanting to obtain a P endorsement had to complete a P endorsement course, but that requirement was removed as a result of lobbying by Uber who had been flouting the law. Drivers must comply with work-time rules and maintain a logbook, with the onus on training falling on companies and drivers since the P endorsement course was abandoned. The New Zealand Taxi Federation is the national advocacy group for taxi companies within New Zealand. The inside of a Japanese taxicab in Kyoto with GPS navigation on board. Most experienced taxi drivers who have been working in the same city or region for a while would be expected to know the most important streets and places where their customers request to go. However, to aid the process of manual navigation and the taxi driver's memory (and the customer's as well at times) a cab driver is usually equipped with a detailed roadmap of the area in which they work. There is also an increasing use of GPS driven navigational systems in wealthier countries. In London, despite the complex and haphazard road layout, such aids have only recently been employed by a small number of 'black cab' taxi (as opposed to minicab) drivers. Instead, they are required to undergo a demanding process of learning and testing called The Knowledge. This typically takes around three years and equips them with a detailed command of 25,000 streets within central London, major routes outside this area, and all buildings and other destinations to which passengers may ask to be taken. Taxicabs have been both criticized for creating pollution and also praised as an environmentally responsible alternative to private car use. One study, published in the journal Atmospheric Environment in January 2006, showed that the level of pollution that Londoners are exposed to differs according to the mode of transport that they use. When in the back seat of a taxicab people were exposed the most, while walking exposing people to the lowest amount of pollution. In Australia, nearly all taxis run on LPG, as well as the growing fleet of hybrids. Argentina and the main cities of Brazil have large fleets of taxis running on natural gas. Many Brazilian taxis are flexible-fuel vehicles running on sugarcane ethanol, and some are equipped to run on either natural gas or as a flex-fuel. At least two Brazilian car markers sell these type of bi-fuel vehicles. Malaysia and Singapore have many of their taxicabs running on compressed natural gas (CNG). San Francisco became in 2005 one of the first cities to introduce hybrids for taxi service, with a fleet of 15 Ford Escape Hybrids, and by 2009 the original Escape Hybrids were retired after 300,000 miles per vehicle. In 2007 the city approved the Clean Air Taxi Grant Program in order to encourage cab companies to purchase alternative fuel vehicles, by providing incentives of US$2,000 per new alternative fuel vehicle on a first-come, first-served basis. Out of a total of 1,378 eligible vehicles (wheelchair-accessible taxi-vans are excluded) 788 are alternative fuel vehicles, representing 57% of the San Francisco's taxicab fleet by March 2010. Gasoline-electric hybrids accounted for 657 green taxis and compressed natural gas vehicles for 131. As of mid-2009 New York City had 2,019 hybrid taxis and 12 clean diesel vehicles, representing 15% of New York's 13,237 taxis in service, the most in any city in North America. At this time owners began retiring its original hybrid fleet after 300,000 and 350,000 miles per vehicle. Two attempts by the Bloomberg Administration to implement policies to force the replacement of all New York's 13,000 taxis for hybrids by 2012 have been blocked by court rulings. Chicago is following New York City's lead by proposing a mandate for Chicago's entire fleet of 6,700 taxicabs to become hybrid by 1 January 2014. As of 2008 Chicago's fleet had only 50 hybrid taxicabs. In 2008 Boston mandated that its entire taxi fleet must be converted to hybrids by 2015. Arlington, Virginia also has a small fleet of 85 environmentally friendly hybrid cabs introduced in early 2008. The green taxi expansion is part of a county campaign known as Fresh AIRE, or Arlington Initiative to Reduce Emissions, and included a new all-hybrid taxi company called EnviroCAB, which became the first all-hybrid taxicab fleet in the United States, and the first carbon-negative taxicab company in the world A similar all-hybrid taxicab company, Clean Air Cab, was launched in Phoenix, Arizona in October 2009. In Japan, electric taxicabs are becoming increasingly popular. In 2009, battery-swap company Better Place teamed with the Japanese government to trial a fleet of electric taxis with the Better Place battery-swap system in Yokohama. In 2010, the taxi company Hinomaru Linousine Company launched two Mitsubishi i MiEV electric taxicabs in Tokyo. Both taxicabs had female drivers and were branded under ZeRO TAXI livery. Hybrid taxis are becoming more and more common in Canada, with all new taxis in British Columbia being hybrids, or other fuel efficient vehicles, such as the Toyota Prius or Toyota Corolla. Hybrids such as the Ford Escape Hybrid are slowly being added to the taxicab fleet in Mexico City. Other cities where taxi service is available with hybrid vehicles include Tokyo, London, Sydney, Rome and Singapore. Seoul introduced the first LPI hybrid taxi in December 2009. The internal combustion engine runs on liquefied petroleum gas (LPG) as a fuel. In 2010 Beijing, China introduced electric taxis. A trial run began in March 2010 with taxis being cheaper than their regular gasoline counterparts. The Taxicab, Limousine & Paratransit Association (TLPA) was established in 1917 in the United States, and is a non-profit trade association of and for the private passenger transportation industry. Today its membership spans the globe and includes 1,100 taxicab companies, executive sedan and limousine services, airport shuttle fleets, non-emergency medical transportation companies, and paratransit services. In April 2011, TLPA announced a nationwide "Transportation on Patrol" initiative. The TOP program gives local police departments the materials they need to train volunteer taxi drivers to be good witnesses and watch out for criminal behavior. Taxicab drivers are at risk for homicide at a far higher rate than the general working population in the United States (7.4 per 100,000 and 0.37 per 100,000, respectively). In efforts to reduce homicides, bulletproof partitions were introduced in many taxicabs in the 1990s, and in the 21st century, security cameras were added to many taxicabs. Security cameras have been shown to be more effective when implemented by cities and not taxicab companies. the demand for taxi services increases, as the prices fall and the quality improves. Deregulation advocates may claim that the taxi service level increases most in the poorest sections of the city. The effect is highest in peak hours and bad weather, when the demand is highest. cities save money, as they do not have to plan and enforce regulation. In nearly all deregulating cities the number of taxis increased, more people were employed as drivers, and deregulation advocates claim needs were better satisfied. Existing taxi companies may try to limit competition by potential new entrants. For example, in New York City the monopoly advantage for taxi license holders was $590 million in the early 1980s. The city has 1400 fewer licenses than in 1937. Proponents of deregulation argue that the main losers are the car-less poor and the disabled. Taxi owners form a strong lobby network that marginalizes drivers and taxi users. It also pays local government officials to uphold taxi regulation. The regulators usually do not wish to rise against the taxi-owner lobby. The politicians do not want taxi drivers to have a negative opinion of them. Taxi deregulation proponents claims that immigrants and other poor minorities suffer most from taxi regulation, because the work requires relatively little education. Regulation makes entrance to the taxi business particularly difficult for them. The elderly, disabled, housewives and poor use taxis more often than others. According to Moore and Rose, it is better to address potential problems of deregulation directly instead of regulating the number of taxi licences. For example, if the regulators want to increase safety, they should make safety statutes or publish a public list of safe taxi operators. Proponents of deregulation also claim that if officials want to regulate prices they should standardize the measures rather than command prices. For example, they may require that any distance tariffs are set for the first 1/5 miles and then for every subsequent 1/3 miles, to make it easier to compare the prices of different taxis. They should not prohibit other pricing than distance pricing. Deregulation advocates claim that regulators only have a very limited information on the market. Black market taxis often have problems with safety, poor customer service, and fares. This situation is made worse because customer who patronize such taxis cannot complain to the police or media. However, proponent of taxi deregulation argue that when these illegal taxis become legalized, their behavior will improve and complaints to officials about these formerly illegal taxis would be allowed. Taxi companies claim that deregulation may lead to an unstable taxi market. However, one pro-deregulation study by Kitch, Isaacson and Kasper claims that the previous argument is a myth because it ignores the U.S. free taxi competition up to 1929. Some deregulation proponents are less opposed to airport taxi regulation than to regulation of other taxi services. They argue that if an airport regulates prices for taxis in its taxi queues, such regulation has fewer disadvantages than citywide regulation. An airport may determine prices or organize different queues for taxi services of different qualities and prices. It can be argued whether rules set by the owner of an airport are regulation or just a business model. Proponents of deregulation argue that partial deregulation is the cause of many cases of deregulation failing to achieve desirable results in United States cities. Many U.S. cities retained regulations on prices and services while allowing for free entrance to taxi business. Deregulation advocates argue that this prevented market mechanisms from solving information problems because new entrants have found it difficult to win new customers using new services or cheap prices. Also, ride-sharing has often been prohibited. Often officials have also prohibited pricing that would have made short rides in sparsely populated areas profitable. Thus drivers have refused to take such customers. Therefore, partial deregulation is not always enough to enhance the situation. One study claims that deregulation was applied to a too small area. In the taxi regulation report by U.S. FTC it was concluded that there are not grounds for limiting the number of taxi companies and cars. These limitations cause a disproportionate burden on low income people. It is better to increase the pay for unprofitable areas than to force the taxis to serve these areas. According to the report, the experience on free entry and price competition are mainly positive: prices have fallen, waiting times were shortened, the market shares of the biggest companies have fallen, and city councils have saved time from licensing and fare setting. However, the airports should either set their own price ceilings or allow for price competition by altering the queue system. Opponents of taxi deregulation argue that deregulation will result in high taxi driver turnover rates which may cause the number of less-qualified taxi drivers to increase, dishonest business practices such as price gouging (especially on airport routes) and circuitous routing, and poor customer service. A Connecticut General Assembly report argues that deregulation fails to cause price decreases because taxi passengers typically do not price comparison shop when searching for taxicabs, and that fares usually increased with deregulation because the higher supply of taxis caused drivers’ earning potential to decrease. This report claims that deregulation resulted in dramatically increased taxi supply, especially at already overserved airport locations, fare increases in every city, and an increase in short-trip refusals by taxicab drivers. This report argues that deregulation has led to undesirable results in several American cities. Seattle deregulated taxis in 1980, resulting in a high supply of taxicabs, variable rates, price gouging, short-haul refusals, poor treatment of passengers. As a result, Seattle re-regulated in 1984, reinstating a restriction on taxicab licenses and fare controls. In St. Louis, deregulation produced a 35% rise in taxi fares, and taxicab drivers complained of waiting hours at airports for customers at taxicab stands. Taxicab companies claimed they increased fares in order to make up for lost competition resulting from the increased supply of taxis. As a result, the St. Louis City Council froze new taxicab licenses in 2002. A study of the deregulation of taxis in Sweden in 1991 showed that the taxicab supply increased, but average fares also increased in almost all cases. Specifically, average fares per hour increased for all trips. Average fares also increased for fares calculated by distance (per kilometer) in almost every category studied – for all customer-paid trips in municipalities of all 3 sizes (small, medium, and large) and increased for municipality-paid trips in small and large municipalities; fares only decreased for municipality-paid trips in medium-sized municipalities that were calculated per kilometer. Deregulation also resulted in decreased taxicab productivity and decreased taxi-company revenues. This study concluded that deregulation resulted in increased fares especially in rural areas and the authors argued that the increased fares were due to low taxi company revenues after deregulation. Taxi companies claim that deregulation would cause problems, raise prices and lower service level on certain hours or in certain places. The medallion system[when defined as?] has been defended by some experts. They argue that the medallion system is similar to a brand-name capital asset and enforces quality of service because quality service results in higher ridership, thus increasing the value of owning the medallion. They argue that issuing new medallions would decrease the medallion value and thus the incentive for the medallion owner to provide quality service or comply with city regulations. They also argue that the medallion may be preferable to alternate systems of regulation (such as fines, required bonds with seizures of interest payments on those bonds for violations, or licensing of all would-be taxis with revocation of that license for violations) because fines are difficult to collect, license revocation may not be a sufficient deterrent for profitable violations such as price cheating, and because using penalties on bond interest payments give regulators an incentive to impose penalties to collect revenue (rather than for legitimate violations). Medallions do not earn interest and thus inappropriate seizures of interest by regulators is not possible. The results of taxi deregulation in specific cities has varied widely. A study of taxi deregulation in nine United States cities found that the number of taxi firms increased, but large incumbent firms continued to dominate all but one of the nine cities. The taxi prices did not fall in real terms, but increased in every city studied. Turnover was concentrated among small operators (usually one-cab operators); little turnover occurred among medium and large new firms and no exit by a large incumbent firm occurred since deregulation. Productivity decreased by at least one-third in all four cities for which sufficient data was obtainable; the authors argued that decreases of this magnitude in productivity have serious economic consequences for taxi drivers, by shifting the industry from employee drivers to lease drivers and causing the average taxi driver to earn a lower income. Innovation in service did not occur in the deregulated cities because such innovations (especially shared-ride service) were doubted by taxi operators to be justified by demand and because the operators viewed that they would cause a net decrease in revenue. Discounts were offered in certain deregulated cities; however, these discounts were small (10% typically) and were also offered in some regulated cities. The study found a lack of service innovation and little change in level of service despite the increased number of taxicabs. In Japan, taxi deregulation resulted in modest decreases in taxi fares (primarily among long distance trips); however, Japanese taxi fares are still very high (still the highest in the world). Also, taxi driver incomes decreased, and the earnings of taxi companies also decreased substantially. Deregulation failed to increase taxicab ridership enough to compensate taxi companies for those losses. The burden of deregulation fell disproportionately on taxi drivers because taxi companies increased the number of taxis rented to drivers (to make more money from rental fees), which resulted in stiff competition among drivers, decreasing their earnings. Transportation professor Seiji Abe of Kansai University considered deregulation to be a failure in the Japanese taxi industry (despite what he considers success in other Japanese industries). In the Netherlands, taxi deregulation in 2000 failed to reach policy objectives of strengthening the role of the taxi in the overall Dutch transport system. Instead, the deregulation resulted in unanticipated fare increases (not decreases) in large cities, and bad driver behavior became a serious problem. Local authorities had lost their say in the market due to the deregulation, and thus were unable to correct these problems. In South Africa, taxi deregulation has resulted in the emergence of taxi cartels which carry out acts of gun violence against rival cartels in attempts to monopolize desirable routes. In South Africa, taxis were deregulated in 1987, resulting in fierce competition among new drivers, who then organized into rival cartels in the absence of government regulation, and which used violence and gangland tactics to protect and expand their territories. These "taxi wars" have resulted in between 120–330 deaths annually since deregulation. These taxi cartels have engaged in anticompetitive price-fixing. In New Zealand taxi deregulation increased the supply of taxi services and initially decreased the prices remarkably in big cities, whereas the effects in smaller cities were small. In Ireland, taxi deregulation decreased waiting times so much that the liberalization became very popular among the public. [dubious – discuss] The number of companies was increased and the quality of cars and drives did not fall. [dubious – discuss] Some have argued that the regulation should be completely abolished, not just cut down. Minister Alan Kelly held a review of Ireland's taxi industry after Ireland's national broadcaster RTÉ broadcast an investigation into the taxi industry 10 years after de-regulation. Dictionnaire historique de Paris. La Pochothèque. 2013. ISBN 978-2-253-13140-3. ^ "The National tribune (Page 2, Image 2)". The National Tribune. 23 May 1907. Retrieved 16 May 2016. ^ Brown, Peter Jensen. "A History of the Taxicab". Early Sports 'n' Pop-Culture History Blog. Retrieved 16 May 2016. ^ "Taxe translation English – German dictionary – Reverso". dictionary.reverso.net. Retrieved 16 May 2016. ^ "Henry George Liddell. Robert Scott. A Greek-English Lexicon. revised and augmented throughout by. Sir Henry Stuart Jones. with the assistance of. Roderick McKenzie. Oxford. Clarendon Press. 1940". Perseus Digital Library. Retrieved 4 June 2016. ^ Thucydides. Historiae in two volumes. book 5. chapter 6. section 5. Oxford, Oxford University Press. 1942. ^ Herodotus, The Histories with an English translation by A. D. Godley.book 3.chapter 89. Cambridge. Harvard University Press. 1920. ^ "taximeter" (Fourth ed.). The American Heritage Dictionary of the English Language (Bartleby). 2000. Archived from the original on 12 July 2001. Retrieved 22 April 2015. ^ Greengrass, Mark. Christendom Destroyed. Penguin Books 2015 pp. 244–245. ^ Fierro, Alfred, Histoire et Dictionnaire de Paris (1996), Robert Laffont, page 1166, ISBN 2-221-07862-4. ^ Gilbey, Walter (1903). Early Carriages and Roads. London: Vinton. p. 29. ^ a b "History of the Licensed London Taxi". london-taxi-cabs.com. Retrieved 22 April 2015. ^ "Les taxis : 378 ans d'histoires et d'engueulades". 14 June 2015. ^ Harris, Penelope (2010). The Architectural Achievement of Joseph Aloysius Hansom (1803–1882), Designer of the Hansom Cab, Birmingham Town Hall, and Churches of the Catholic Revival. The Edwin Mellen Press. pp. 86–91, 93. ISBN 9780773438514. ^ Frost, Karolyn Smardz; Osei, Kwasi (Cover design); South, Sunny (Cover art) (2007). I've Got a Home in Glory Land: A Lost Tale of the Underground Railroad. New York: Farrar, Straus and Giroux. ISBN 978-0-374-16481-2. Retrieved 22 April 2015. ISBN 978-0-374-53125-6. Winner, 2007 Governor General's Literary Award for Nonfiction; Nominee (Nonfiction), National Books Critics Circle Award 2007. See, Governor General's Award for English language non-fiction. ^ "The Surprisingly Old Story Of London's First Ever Electric Taxi - Science Museum Blog". 9 July 2012. ^ "Hailing the History of New York's Yellow Cabs". ^ "Car Companies". The Early Electric Car Site. Retrieved 6 February 2016. ^ Brown, Peter Jensen. "A History of the Taximeter". Early Sports 'n' Pop-Culture History Blog. Retrieved 16 May 2016. ^ "The Mercedes Benz Taxi". MercedesClass.net. Retrieved 16 May 2016. ^ Cecil Adams (31 October 1980). "Why does every city seem to have a Yellow Cab company?". The Straight Dope. Retrieved 4 April 2012. ^ Weldon, Chichester Percival (1986). The New Departure Classics. Public Library, Bristol, Connecticut: Phoenix Publishing, Canaan, NH. pp. 14, 16, 19–21. ISBN 978-0914659181. ^ Hendry, Maurice D. (Spring 1970). "The Fred Moskovics Era". Automobile Quarterly. 8 (3): 240. ^ Dictionnaire Historique de Paris 2013, p. 750. ^ Fierro 1996, p. 1166. ^ Hill, Alan Stuart (12 September 2005). "Birmingham Pub Bombings, November 21, 1974". birmingham999. Archived from the original on 15 May 2008. Retrieved 22 April 2015. ^ Swiss teacher starts China leg of global solar taxi tour. Xinhua News. ^ "Get the Free Taxi Button at your Business - Sign Up Today". Retrieved 28 April 2017. ^ "Centralized Dispatching | UTCC". www.goutcc.org. Retrieved 11 December 2017. ^ "Taxi Licence - New South Wales". ^ "Driving a commercial passenger vehicle". ^ "Apply for driver authorisation or operator accreditation". ^ "Driver accreditation for large or small passenger vehicles". ^ "Applying for driver accreditation". ^ "Driving a passenger service vehicle". ^ "Small passenger services review". ^ "More relaxed Uber and taxi rules from this Sunday". ^ "Logbooks and work time: Taxi and SPS Vehicle Drivers". ^ "New Zealand Taxi Federation". ^ ""Taxi 07 Roads Forward", page 135" (PDF). Retrieved 4 April 2012. ^ Christine Lepisto (27 August 2006). "Fiat Siena Tetra Power: Your Choice of Four Fuels". Treehugger. Retrieved 24 August 2008. ^ "Nouvelle Fiat Siena 2008: sans complexe" (in French). Caradisiac. 1 November 2007. Archived from the original on 1 July 2008. Retrieved 31 August 2008. ^ GNVNews (November 2006). "Montadores Investem nos Carros á GNV" (in Portuguese). Institutio Brasileiro de Petroleo e Gas. Archived from the original on 11 December 2008. Retrieved 20 September 2008. ^ a b "Ford's US Hybrid Sales Up 73% for First 9 Months of 2009; Total US Hybrid Sales Down 14% for Same Period". Green Car Congress. 14 October 2009. Retrieved 17 October 2009. ^ a b "Halfway to a Green Taxi Fleet in San Francisco". HybridCars.com. 22 March 2010. Retrieved 12 April 2010. ^ a b "Mayor Newsom Announces That More Than Half of San Francisco's Taxi Fleet is Alternative Vehicles". San Francisco's Office of the Mayor (Press release). 22 March 2010. Archived from the original on 29 May 2010. Retrieved 12 April 2010. ^ Gordon, Rachel; Knight, Heather (23 March 2010). "More than half of taxis now green, Newsom says". San Francisco Chronicle. Retrieved 12 April 2010. ^ William Newman (29 March 2009). "Panel Enacts Incentives for Hybrids in Cab Fleets". The New York Times. Retrieved 14 April 2010. ^ Fred Gober. "Hybrid taxis slowly catching on in the west". Infotaxi. Retrieved 17 October 2009. ^ Sewell Chan (31 October 2008). "Judge Blocks Hybrid Taxi Requirement". The New York Times. Retrieved 14 April 2010. ^ Michael M. Grynbaum (30 September 2009). "Federal Bill Would Clear Way for Green Taxi Fleet". The New York Times. Retrieved 14 April 2010. ^ "City Council Wants All-Hybrid Taxi Fleet By 2014". CBS Chicago. 12 June 2008. Archived from the original on 22 July 2009. Retrieved 25 October 2009. ^ "Boston's taxi fleet to go hybrid by 2015". Boston Globe. 29 August 2008. Archived from the original on 6 April 2009. Retrieved 17 October 2009. ^ "EnviroCAB Launches in Greater Washington, D.C. Area To Become Nation's First 'Green' Taxi Fleet". EnviroCAB Press Release. 11 February 2008. Archived from the original on 27 March 2012. Retrieved 14 July 2011. ^ Downey, Kirstin (7 September 2007). "Arlinton County: Board Gives Go-Ahead to Eco-Friendly Taxicabs". The Washington Post. Retrieved 17 October 2009. ^ a b "All-Hybrid Taxi Fleet Debuts in Sunny Phoenix". GreenBiz. 20 October 2009. Retrieved 10 July 2010. ^ Domenick Yoney (26 August 2009). "Better Place to trial battery-swapping taxis in Tokyo". Green.autoblog.com. Retrieved 4 April 2012. ^ Domenick Yoney. "Mitsubishi i MiEVs to become taxis in Tokyo". Green.autoblog.com. Retrieved 4 April 2012. ^ "Trend Watch: Taxis Go Green to Save Cash, Emissions, and Oil". Greencar.com. 29 March 2009. Archived from the original on 11 July 2011. Retrieved 17 October 2009. ^ Seoul Metropolitan Government, PRNE (17 December 2009). "Eco-Friendly Hybrid Taxi Introduced in Seoul". PR Hub. Retrieved 13 April 2010. ^ "Electric Taxis Begin Trial Run on Beijing's Roads". eChinacities. 4 March 2011. Archived from the original on 7 March 2011. Retrieved 7 March 2011. ^ "TLPA Introduces Nationwide Transportation On Patrol Initiative". Chicagodispatcher.com. 5 January 2011. Retrieved 4 April 2012. ^ Menéndez, Cammie Chaumont (8 July 2013). "Reducing Taxicab Homicides". National Institute for Occupational Safety and Health. Retrieved 18 January 2015. ^ a b c d e f g h i j k l m n o p q r s Moore, Adrian T.; Balaker, Ted (January 2006). "Do Economists Reach a Conclusion on Taxi Deregulation?" (PDF). Econ Journal Watch. 3 (3): 109–132. Retrieved 29 April 2018. ^ Moore, Adrian T.; Rose, Tom (January 1998). "Regulatory Reform At The Local Level: Regulating For Competition, Opportunity, And Prosperity" (PDF). Indianapolis Deregulation Policy Study No. 238. p. 23. Retrieved 29 April 2018. ^ "Taxi deregulation brings only regret". Toomanytaxis.com. Retrieved 4 April 2012. ^ a b c d e f Kristina Sadlak, Legislative Fellow (19 April 2004). "Taxicab Deregulation". Cga.ct.gov. Retrieved 4 April 2012. ^ Snead, Jason (10 December 2015). "Taxicab Medallion Systems: Time for a Change". The Heritage Foundation. Retrieved 19 February 2016. ^ a b c d Gallick, Edward C.; Sisk, David E. (1987). "A Reconsideration of Taxi Regulation". Journal of Law, Economics & Organization. 3: 117–128. Retrieved 29 April 2018. ^ a b c d e f g Roger F., Teal; Mary, Berglund (1987). "The Impact of Taxicab Deregulation in the USA". Journal of Transport Economics and Policy. 21 (1): 37–56. Retrieved 29 April 2018. ^ a b c d e Wiseman, Paul (4 March 2005). "Japan's taxi drivers feel squeeze". USA Today. Retrieved 4 April 2012. ^ a b c "European Transport Conference: Ten years of taxi deregulation in the Netherlands – the case for re-regulation and decentralisation". Etcproceedings.org. 30 November 1999. Archived from the original on 18 October 2012. Retrieved 4 April 2012. ^ a b Wines, Michael (17 September 2006). "South Africa's taxi wars taking toll". Seattle Times. Retrieved 4 April 2012. ^ "From Low Intensity War to Mafia War: Taxi violence in South Africa (1987–2000) – Jackie Dugard". Csvr.org.za. Archived from the original on 9 February 2012. Retrieved 4 April 2012. ^ "The South African Taxi Industry". Archived from the original on 24 February 2007. Retrieved 11 April 2007. ^ "Government Report on Taxi Regulation Review - National Transport Authority". 31 January 2012. Wikivoyage has a travel guide for Travelling by taxicab.